I have quite a few clients that ask me about price lists for my work and I have one I swear. But I have wanted to put together a little visual to go with my pricing sheet for months now so that when clients were looking over my products, they could see what things actually were, how they look on a wall. I have a wall in my studio that I have each type of mounted print I offer and a few canvases I have had made to showcase my work but if you are a wedding or engagement client, or you've had a family session done outdoors, the chances of you seeing my work hanging on my wall in my little studio is pretty slim. Newborn clients see it and folks who are coming for cakes mashes or Christmas minis, but that's about it and that's only a small percentage of my clients. So I finally buckled down and took the shot I wanted of each of these mounted prints I have so the following will be a description of each of those as well as the canvases I offer, and photos to match so that you can see exactly WHAT the difference is between a standout mounted print and a canvas, or a masonite and a matboard print and WHY you want these prints displayed in your home! MOUNTED PRINTS - WHY a mounted print vs. a standard print? 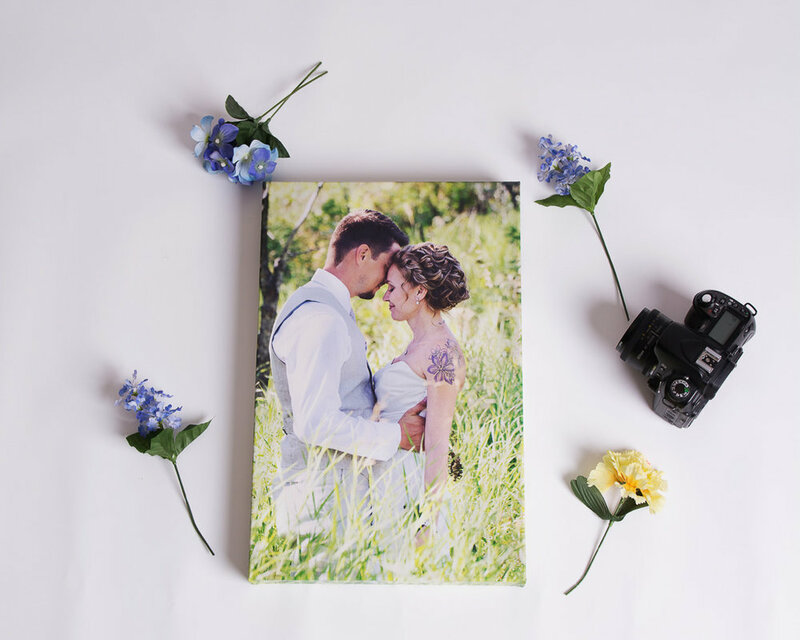 Mounted prints are paper photographs that have been mounted to a sturdy material whether it's white or black styrene or masonite, matboard or a type of particle board. These surfaces are so much more durable than a regular paper photographic print, they are less likely to warp, they last much longer and you can simply mount them to a wall as they are and they look phenomenal or you can choose to frame them (except a Standout, which comes ready to hang out of the packaging and looks fabulous!). You don't have to worry about them getting kinked or bent or torn if they are mounted and you can order them to give as gifts and your family and friends can unwrap them and instantly hang them on the wall! 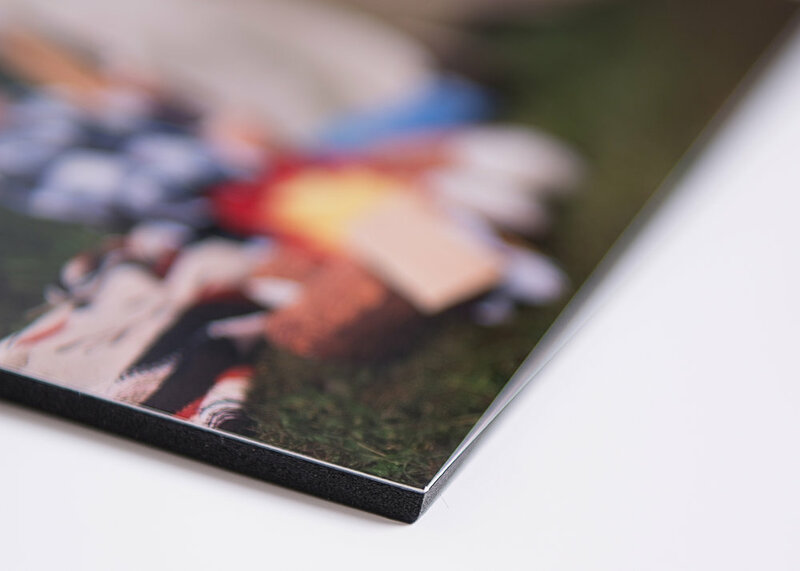 This shot is an angled shot to show you the thickness of the black styrene (also available in white for select sizes). You can also see a canvas with a black siding hanging just below it. This is a fantastic, economical material that is not susceptible to warping so it looks great for a very long time. 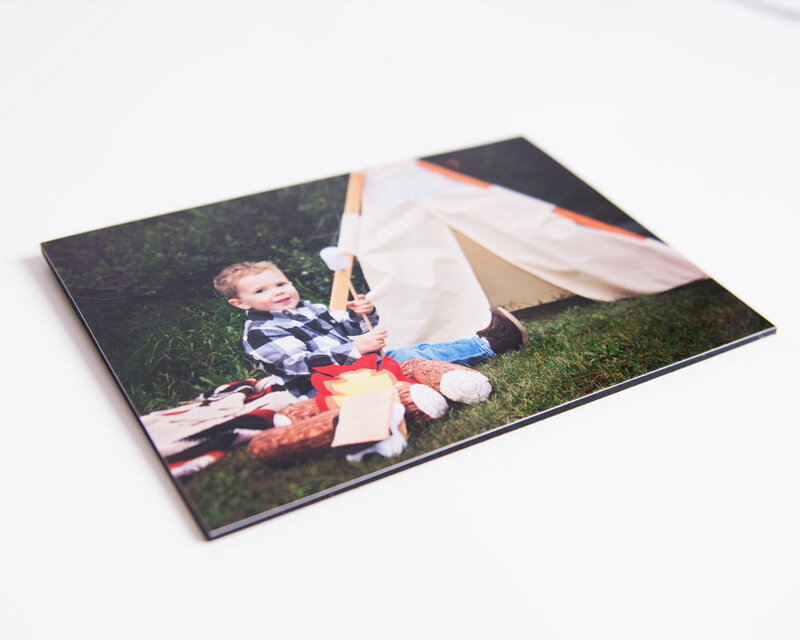 Masonite is a strong, sturdy material to have your most precious portraits on because it does not break easily. Your images will last for years on this material and it's got a nice heavy feel to it. I love this combination! The metallic finish on the paper makes the photo really pop and add to the sharpness of it, making it look extra breathtaking. The matboard makes it strong and sturdy yet sleek with the black backing. You can prop it in an easel or mount it to your wall and of course, can still be framed. Standout Mounted Prints are my FAVOURITE!! Well I'm not sure I can say that, I love all the mounted prints. I feel like they just class up and toughen up my prints just a little bit and I love it. 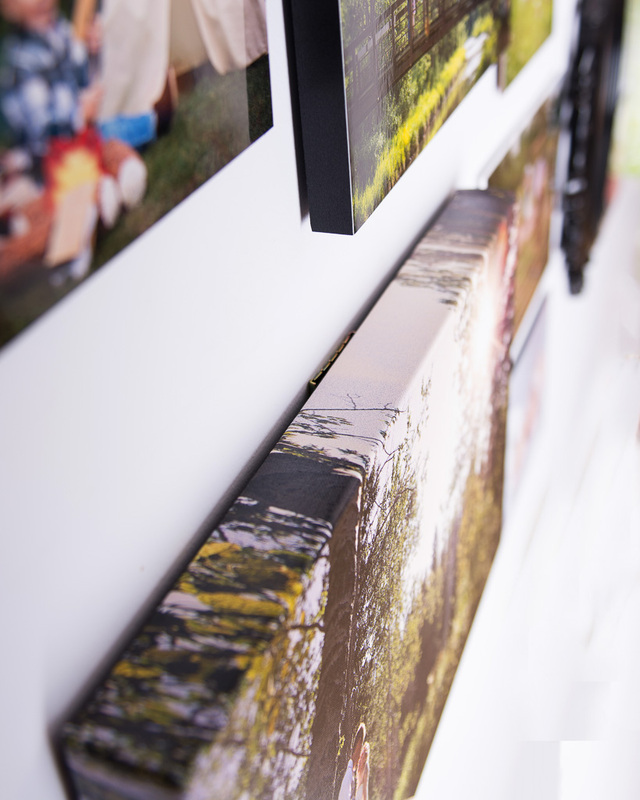 So standout mounted prints, they look a lot like canvases. They are a piece of photographic paper (your image, in any texture you'd like - from regular lustre or glossy paper to linen, or pebble texture, metallic paper, embassy textured paper. Any combination, you name it I will make it for you!) that is pressed to a piece of lightweight foam and encased in sleek plastic edging. These are FANTASTIC, they look so great, so classy and top of the line but they're amazingly priced and very lightweight. In fact, they weigh next to nothing. They come with a couple holes in the back to hang on a wall, or you can prop them in an easel. I like to get those 3M velcro strips and stick them to the wall. Easy Peasy! This print is a glossy finish mounted to a 3/4" black standout. I LOVE CANVASES. How strong and sturdy these are. These are perfect when you want to take your images to the next level. In the baby's nursery, on your dominant photo wall in your living room, along your hallway walls. This amazing work will make your memories stand out and really pop for everyone to see. 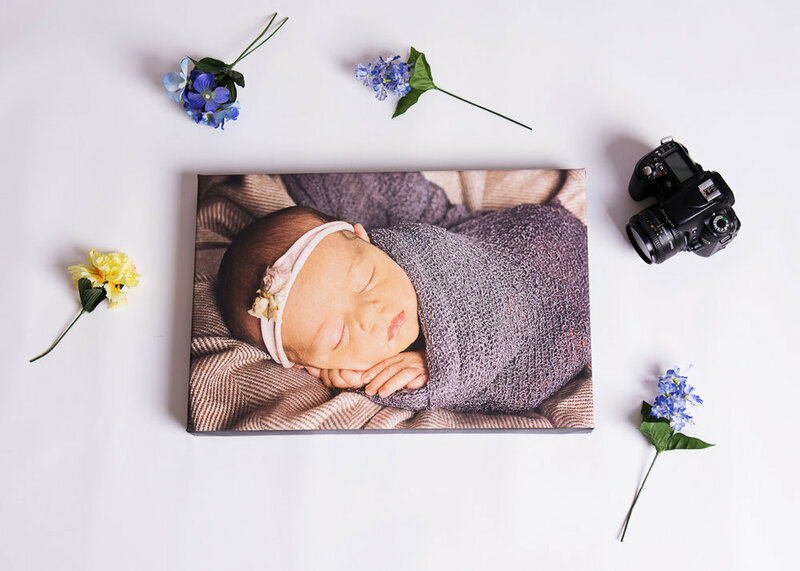 Depending on the size of canvas you would like to order you can choose the thickness of the canvas, anywhere from 1' to 1.5". These canvases are hand-stretched to ensure perfection, the corners are folded meticulously for quality. Not by a machine. By a professional. You can choose to have a black or white border like the one shown here. 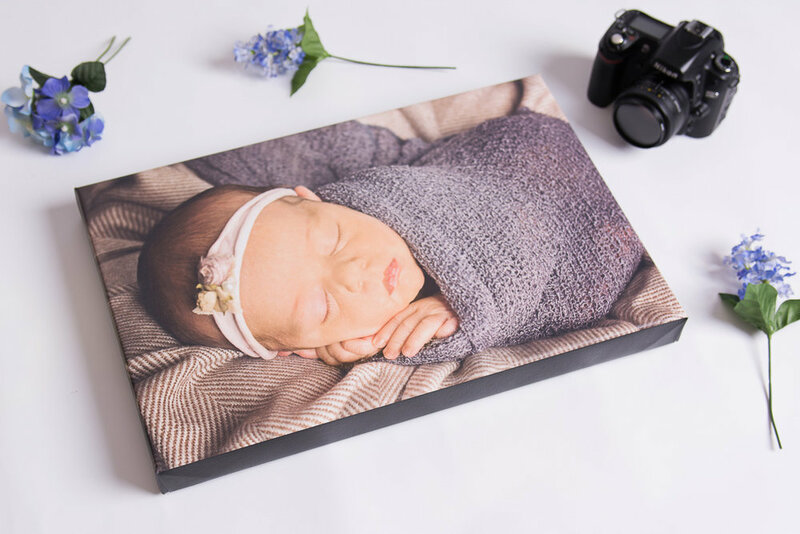 You can also have a natural edge where the photo just just stretched but you will lose part of your image which is important to consider when choosing the portraits you want on a canvas. 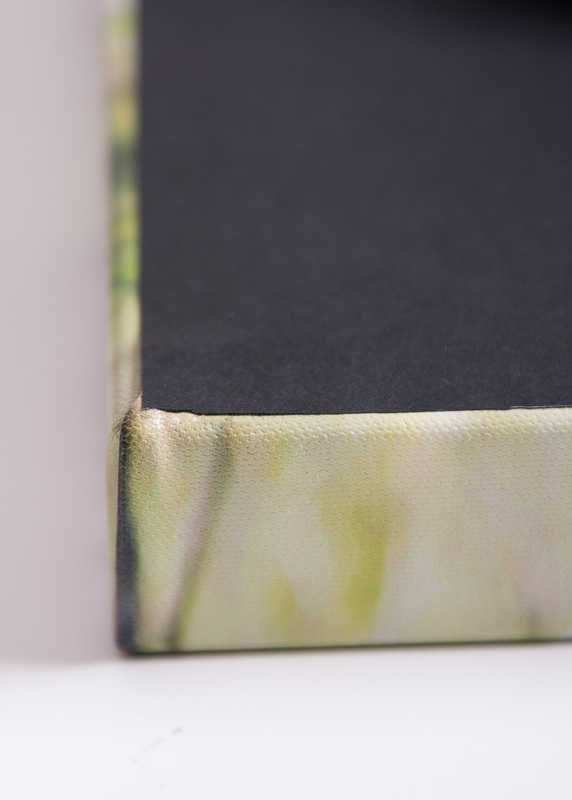 Depending on the sizing of your canvas, you can choose to add a black paper backing onto your canvas to add to the polished look, or you can leave it open. 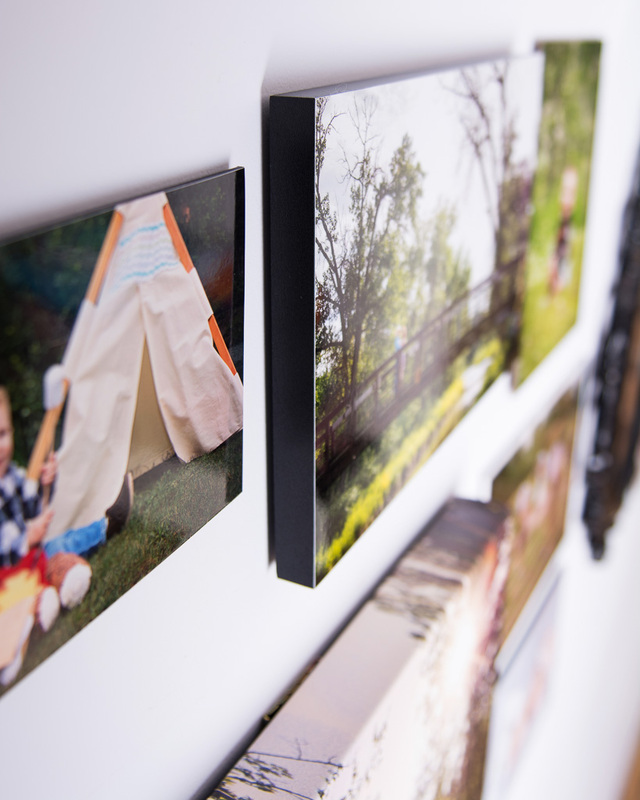 You can choose between a metal claw or a wire hanger to mount your images to your wall. Some sizes only allow for one type of support so please inquire regarding the sizing you'd like. These are of course just some of the products that Lace & Locket Photography offers. I will be doing a post about all the albums and books I offer for Weddings, Engagements and Newborns. I also offer matted prints for guest signing at weddings, thank you cards, birth announcements but I will save those for another time. If you would like to see any of these products in person, please feel free to contact me and I would be glad to come over or to meet you for a coffee and bring all my studio samples so you can see and touch for yourself! You can also email me for a current price list.